Ten million deaths globally by 2050 at a cost of £66 trillion is the stark prediction of the 2016 O’Neill report if we do not address antibiotic resistance. In response we’ve been tasked by government to halve the number of Gram-negative bacteraemias, as well as halve inappropriate antibiotic prescribing, by 2021. Where’s the best place to start? The obvious place for Gram-negative bacteraemias is to look at urinary catheter use and how we manage urinary tract infection (UTI): E. coli causes about 55% of these bloodstream infections, about 45% of which originate from the urinary tract. Jon Otter and Martin Keirnan’s blog nicely depicts the fierce debate around the Gram-negative ambition between clinicians working in the infection field. World Antibiotic Awareness Week is the perfect occasion for you to discuss prescribing practices with your colleagues. Why not challenge them? Do they know when to use a urine dip stick and when not to? Do they know how to take a mid-stream urine sample and minimise contamination? Since setting the targets, we have an extensive set of data to help guide where our interventions need to be focused in order to reduce Gram negative bacteraemias. This is where quality improvement tools can be used to identify specific problems and solutions. Do you know what your local data looks like? What are your top three areas of concern? Embedding good prescribing principles into everyday practice is essential to improving antimicrobial stewardship, tackling the national ambition of inappropriate antibiotic prescribing and facilitating a reduction in Gram negative bacteraemias! Trusts and CCGs together need to review cases to learn how to reduce patient risk. Does your local practice already include the following? the ToDipOrNotToDip programme to improve diagnostic stewardship of UTI in older people: while up to a half of nursing home residents are diagnosed with a UTI in any six-month period, this programme has shown that half of them will have a positive dipstick but don’t have a UTI and don’t need antibiotics! patients supported in self-care – the patient information leaflets in the PHE TARGET resources give UTI self-care advice. County Durham and Darlington show how much can be achieved with a collaborative, determined and multifaceted team approach to improvement … and of course hard work and enthusiasm: 5% fewer E. coli bacteraemias and a 23% fewer trust apportioned E. coli bacteraemias. ‘Urinary catheter champions’ are running systematic improvement projects and education and training for specific high use areas. Informed by root cause analysis of inappropriate UTI management all clinical staff are now educated in appropriate UTI diagnosis and management, including through the implementation of UTI walk arounds. Care homes have been given UTI packs contain dehydration guides and quick tips on preventing UTIs. Does the patient have a UTI and is an antibiotic necessary? Asymptomatic bacteriuria is common in older people and does not require an antibiotic. So, don’t use a urine dipstick to aid clinical diagnosis of UTI in patients over 65. Do rule out urethral and vaginal causes as 80% of women with a vaginal discharge don’t have a UTI and other causes should be investigated. Whenever possible in secondary care do send a mid-stream urine specimen for analysis. 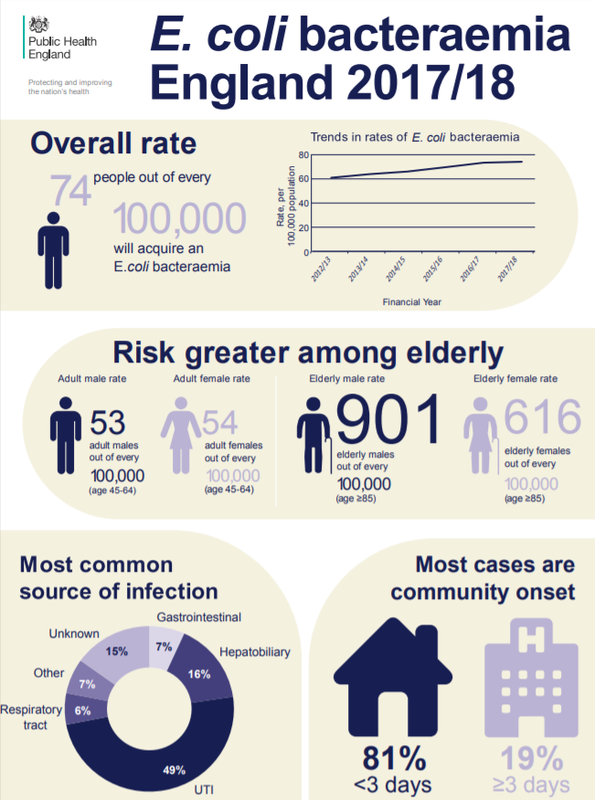 PHE’s Diagnosis of urinary tract infections guideline (very recently updated!) gives clear advice on how to diagnose UTI in children and adults, including when to worry about sepsis and the deteriorating patient. Which antibiotic? Keep your prescribing guidelines up-to-date with the evidence-based UTI guidance from NICE and use local drug-bug resistance data (easily accessed on the PHE Fingertips AMR Portal) as well as a patient’s resistance risk to inform choice. Recurrent UTI, care home residency, and recent hospital care all increase the risk – the empirical antibiotic for a lower UTI in adults is nitrofurantoin as it has an coli resistance rate of 3%; it’s 34% for trimethoprim (ESPAUR 2017 report). When should the antibiotic be reviewed? Ideally antibiotic prescriptions in secondary care should be reviewed daily. Recommendations from Start Smart then Focus guidelines suggest at 24 to 72 hours from initiation. In secondary care, antibiotics should be reviewed and switched as soon as susceptibility data is available for the causative organism. What’s the correct duration, dose and route? Dose and duration should be guided by local antibiotic guidelines and when choosing the dose remember to consider the patient’s renal and liver function. An antibiotic’s – pharmacokinetics and pharmacodynamics will tell you if it can achieve optimal drug levels in the urine, renal tissues and/or prostate. Nitrofurantoin and fosfomycin are not recommended for patients who may have pyelonephritis (temp above 37.9oC, flank pain, nausea or vomiting). Site of infection and diagnosis, antimicrobial susceptibilities, gastrointestinal absorption, bioavailability of the drug and severity of infection all go into the mix when choosing route.